Another classic Christmas recipe from the Betty Crocker's Cooky Book. 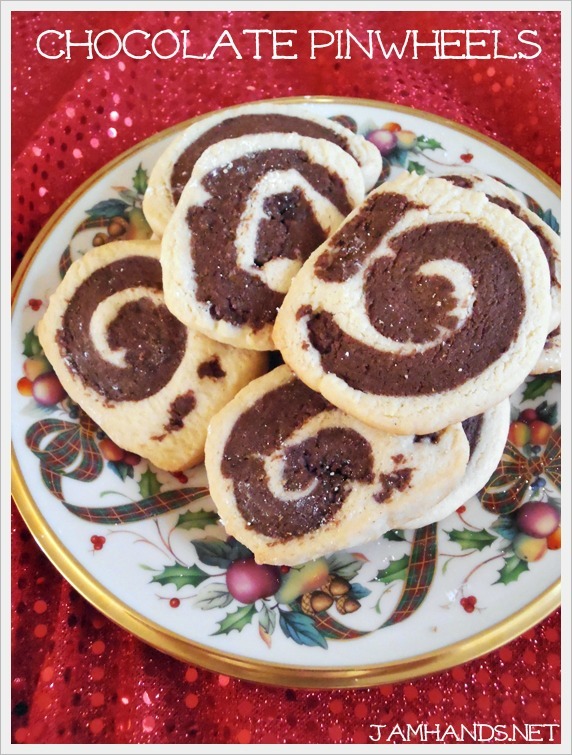 This version takes Ethel's Sugar Cookies and tweaks the recipe just a bit to make delicious Chocolate Pinwheels. 1. Mix shortening, sugar, eggs and vanilla thoroughly. Mix the flour, baking powder, and salt together. Blend in. Divide dough in half. Blend 2 squares of melted and cooled unsweeteed chocolate (2 oz.) to one half of the dough. Chill. Roll remaining dough into an oblong, 12x9". Roll chocolate dough into the same size; lay on top of white. Roll together until 3/16" thick. Roll up tightly, beginning at wide side. Chill again. 2. Heat oven to 400-f degrees. Cut 1/8" thick slices; place on parchment lined baking sheets. Bake 8-10 minutes, or until the edges just barely begin to brown. Recipe from Betty Crocker's Cooky Book.